A few weeks ago, the City of Toronto workers were on strike. The weeds were growing very tall in the parks. No-one was mowing them. I enjoyed watching this bounty appear. 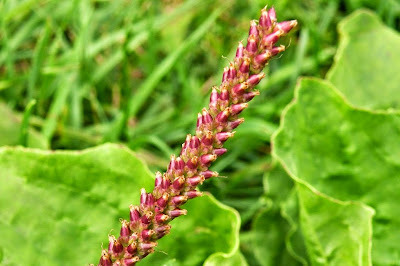 One weed that has intrigued me since childhood when I would pull the stringy leaves apart in the playground is Greater Plantain (Plantago major). With the plantain growing so tall and big, I decided to harvest some with the goal of having some edible nutlets to eat in pancakes or to cook up within a stew or simply roast up as biscuits. You can eat the young leaves straight off of the plant, and use the older leaves as 'pot greens', i.e. boil them up a bit like spinach with salt and butter and eat them that way. I collected big handfuls of both the Greater Plantain and of the Narrowleaf Plantain (Plantago lanceolata), also known as English Plantain. I wanted the seeds or nutlets as they are also called. Plantain leaves are also medicinal. I experienced this directly once recently after being bitten by a tiny little itsy-bitsy red ant. The bit felt like a burning nugget of phosphorus wedged in my leg (well, maybe not that bad), so I crushed up some plantain leaves to get the juice out, and rubbed it on the bite. The bite stopped hurting within 5 seconds and the pain vanished completely. "All of the plantains contain a high level of tannin and the seeds have a high mucilage content. The astringent property of the leaves due to the tannin makes the leaves useful for all types of sores on the skin, cuts, bites and various inflammations. A tea brewed with the seeds is a treatment for diarrhea and dysentery and for bleeding in the mouth or other mucous membranes." I gently roasted the seed heads in the oven, and then stripped the seeds off of the stalks. I gathered it all up and took out any remaining stalk pieces and tried to separate some of the seed from the chaff by tossing it and disposing of the empty seed heads. The kitchen smelled indescribably wonderful - like baking bread, like sweet melons, and molasses... most unuasual, but nice. I then poured it all into an empty Patak's curry jar, with high hopes of cooking something delicious. and I will let you know what I do with them.